Handing out player grades for Oregon and Florida State players after the Ducks' 59-20 win over the Seminoles in the Rose Bowl. The waiting was finally over. After all the breakdowns and previews and talking heads and tweets and discussions, the Rose Bowl was on our televisions and in our lives. The reigning national champions took on Oregon in Pasadena, with last year’s Heisman Trophy winner, Jameis Winston, facing off against this year’s winner in Marcus Mariota. The play on the field matched the hype initially, with Oregon getting out to an early lead to set up the Florida State comeback narrative perfectly. But the Ducks took advantage of seemingly every mistake by the Seminoles -- and the 'Noles made plenty of them -- for a 59-20 Oregon win to move on to the national championship in Arlington, Texas, on Jan. 12. Below you’ll find some player grades, highlight plays and a sampling of some of the best Twitter reactions from Thursday’s Rose Bowl semifinal game. Mariota got cooking midway through the first, hitting easy throws and scrambling around -- basically doing what he has all year. He started 8-of-9 and looked extremely sharp, but missed a throw over the middle and tossed a floater that should have been intercepted by Jalen Ramsey. Mariota had great burst on his runs and was very good on the short throws. He made one mistake on a pass over the middle and was picked off with 16 seconds remaining in the first half, just his third interception of the season. In the second half, Mariota wrecked Florida State with precision. It’s almost like this guy should win awards or something. He had a slow start, bobbling a snap and fumbling on the Seminoles’ first drive. Receivers continued to drop good throws from Winston throughout the game. He sometimes seems like he wants to make the more difficult throw rather than take the underneath route because he trusts his arm so much, but then he makes the read and puts it in a perfect spot. Of course, the most memorable play of Winston’s night was his lost fumble when he flipped the ball backwards on fourth down late in the third quarter. The blunder led to a defensive touchdown that sealed the Ducks’ win. Things got worse from there, as receiver Travis Rudolph dropped a Winston pass into Oregon safety Erick Dargan’s hands for an interception. The true freshman had a one-yard touchdown run for Oregon’s first score of the game, but accumulated only 16 yards in the first half on fewer than three yards a carry. Freeman was not used much as Oregon had better success running the ball with Thomas Tyner and Mariota. Freeman did get another score to put the Ducks up 25-13 with 11:54 left in the third. The key with Cook is touches: Get him the ball and watch him go. 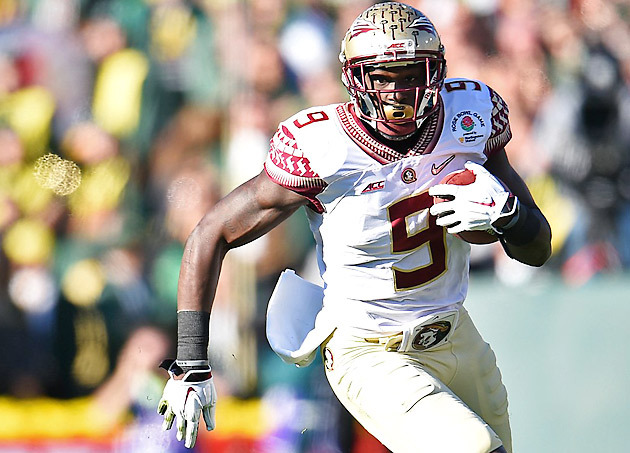 Florida State still got Karlos Williams involved, but Cook made the most of his opportunities -- in the first half. After he racked up 90 yards in the opening two quarters, Cook had two crushing fumbles in the third, both halting promising drives. Winston came over to console Cook after the second one, but the damage was done. Pharaoh Brown’s replacement was used often in the passing game, despite having just 45 yards coming into the game. He made a big first-down catch for 30 yards after Cook’s first fumble. Overall, Baylis did a good job of securing the football when Mariota called his number, forcing Florida State to respect him, which opened things up even more for the Heisman quarterback. The senior had an up and down first half and wasn’t able to score on a few runs in the red zone. He finally got in on a 10-yard carry with 36 seconds left in the first half. Williams averaged 6.7 yards per carry on an 80-yard day. He had two catches for four yards to go with a big drop in the first half, which wasn’t what anyone expected from the ACC's career leader in receiving yards. Rudolph had his best single-game mark in receiving yards against the Ducks, and his 18-yard touchdown in the third quarter seemed big at the time. The freshman was building trust with Winston late in the game until he couldn’t reel in the catch that became Winston’s only interception. Florida State neutralized Marshall, holding him to just five catches for 20 yards. He didn’t have a catch in the third quarter, and Mariota didn’t look his way often. After returning the opening kickoff, Allen left the game and ended up with his knee wrapped in ice. He wasn’t able to return, taking out one of Oregon’s most explosive players and putting more weight on the Ducks' other offensive options. An injury in pregame warmups seemed to hinder O’Leary throughout the game, and he wasn’t as involved as he typically is for the Seminoles. The senior was limited to just one catch for four yards. • Oregon’s first-half goal line stand: Trailing 8-3, Florida State threatened to retake the lead as Cook got the ball down to the one-yard line late in the first quarter. It was a strong drive by the Seminoles and one that looked like it could be critical in keeping pace with the speedy Ducks. 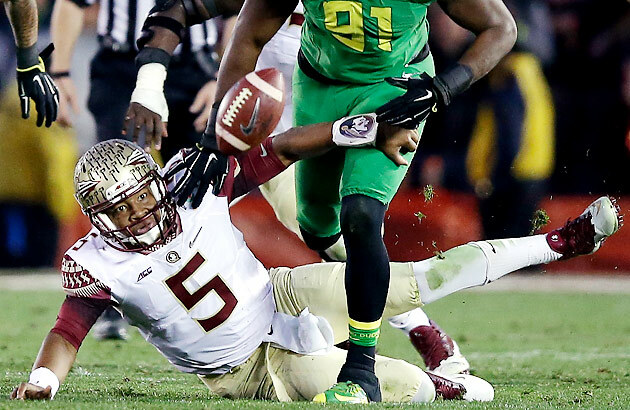 But the Oregon defense stepped up, stopping Florida State as the clock flipped from the first to the second quarter. The Seminoles opted to go for it on fourth down, and the referees initially ruled that Winston had scored on an option keeper, but a review showed his knee was down with the ball just short of the goal line. The Ducks then drove 88 yards over 19 plays to kick a field goal and go up 11-3. • The Mariota scramble: With Oregon facing a third-and-three at its own 46-yard line late in the second quarter, Florida State got pressure, backing Mariota up and forcing him out of the pocket. He eluded one tackler, then another and found Carrington for 21 yards and a first down to keep the drive going. Five plays later, Tyner scored a one-yard touchdown, and the Ducks were up 18-6 with 2:18 left in the half. This was a perfect encapsulation of Mariota’s play at Oregon and something we’ve come to expect from the Heisman winner. • Jameis to Jesus: With Florida State trailing 25-13 in the third quarter, the Seminoles needed a big play. On third-and-21, Winston found Jesus Wilson, who slipped underneath, curled up the sideline and secured the football before falling out of bounds past the sticks. That led to the Rudolph score to cut it to 25-20, a score that seemed to keep the Seminoles up to pace with the Ducks at the time. • Carrington slips away: First Mariota hit Baylis for a first down, so the ‘Noles overcorrected and put a second guy on the tight end. That freed up Carrington in one-on-one coverage. Mariota saw it and hit Carrington past the first-down mark. One missed tackle gave him daylight, and Carrington went 56 yards for a score with 6:43 left in the third quarter. It was just a great play by Mariota to recognize the coverage and make the throw and an even better play by Carrington to slip the tackle and sprint into the end zone. • The Winston fumble heard ‘round the world: A simple Vine will suffice. The first College Football Playoff game (of all time!) didn’t disappoint, and neither did anyone watching from home. Here were a few of the best social moments. Dear @CFBPlayoff, I know we just met, but I think I love you. Everytime I watch Oregon play, I think there's some 8-year old at their controller hitting the B-button. This game is the Masque of the Red Zone Death. Shockingly, Florida State can't be declared dead in the first half. Twilight zone. RT @ralphDrussoAP In the last few minutes: Mariota INT. Green drop. Aguayo miss. Dalvin's fumbles were an issue early in the year, but Jimbo knew they had to take the good with the bad ... been mostly good til now. Until you show me the head, I will not believe it. Nope. I wonder what the punters are doing. That's two turnovers that led directly to TDs. And a fourth-down stop six inches short of goal-line. Tough to beat good teams like that. "No offense to the other teams, but this isn't NC State..." -- Chris Fowler. Oregon is first team to ever hit 50 points in the Rose Bowl. Oregon’s gone on a 41-7 run… since halftime.